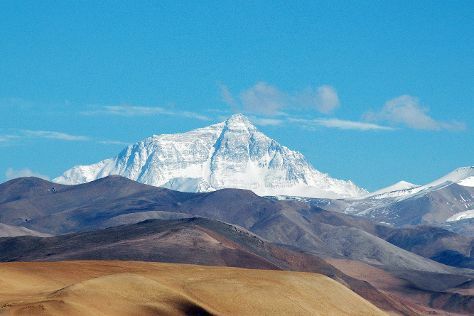 Escape the urban bustle at Mt Everest and Khumbu Glacier. Step out of Sagarmatha National Park with an excursion to Sherpa Museum in Namche Bazaar--about 1h 05 min away. To find other places to visit, where to stay, traveler tips, and other tourist information, use the Sagarmatha National Park vacation planner. Kathmandu to Sagarmatha National Park is an approximately 1.5-hour flight. Finish your sightseeing early on the 11th (Fri) to allow enough time to travel to Kathmandu. Take a break from the city and head to Climbing Tours and River Rafting & Tubing. Make the 16th (Wed) an unforgettable day with an extreme tour. And it doesn't end there: take in the spiritual surroundings of Boudhanath Stupa, soothe aching muscles at some of the top local wellness centers, contemplate the long history of Kathmandu Durbar Square, and take in nature's colorful creations at Garden of Dreams. For reviews, more things to do, where to stay, and other tourist information, read our Kathmandu road trip planning site . Fly from Sagarmatha National Park to Kathmandu in 1.5 hours. In January, daytime highs in Kathmandu are 21°C, while nighttime lows are 3°C. Wrap up your sightseeing on the 17th (Thu) early enough to travel to Sauraha. Kick off your visit on the 18th (Fri): look for all kinds of wild species at Chitwan National Park. Here are some ideas for day two: identify plant and animal life at Elephant Breeding Centre, then contemplate the waterfront views at Narayani River, and then don't miss a visit to Tharu Cultural Museum & Research Center. To find maps, ratings, where to stay, and more tourist information, read Sauraha day trip website . Getting from Kathmandu to Sauraha by combination of flight and car takes about an hour. Other options: take a bus; or drive. Traveling from Kathmandu in January, expect somewhat warmer with lows of 9°C in Sauraha. Wrap up your sightseeing on the 19th (Sat) early enough to drive to Pokhara. Step out of the city life by going to Parasailing & Paragliding and Devi's Fall. And it doesn't end there: contemplate the waterfront views at Phewa Tal (Fewa Lake), take in the spiritual surroundings of Peace Temple, soothe aching muscles at some of the top local wellness centers, and take in the local highlights with Walking tours. To see ratings, maps, where to stay, and tourist information, read our Pokhara trip itinerary builder website . Traveling by car from Sauraha to Pokhara takes 2.5 hours. Alternatively, you can take a bus. In January in Pokhara, expect temperatures between 23°C during the day and 9°C at night. Wrap up your sightseeing on the 22nd (Tue) early enough to travel back home.